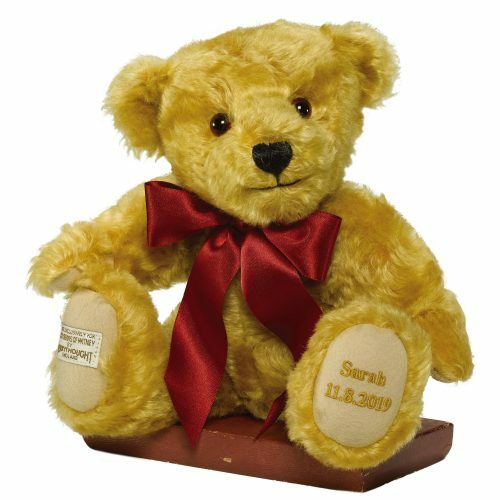 Our traditional English Merrythought bear can be personalised by having a name and date embroidered on the left foot. The embroidery can be in gold (as shown), brown, blue or pink. Up to 10 characters, including dots and spacings, can be embroidered on each line. Softly pellet filled, this wavy gold mohair bear has amber and black safety eyes and felt paw pads. The ribbon can be red (as shown), blue or pink. We will receive your bear, personalised to your wishes, within two weeks from the date of ordering.